If you have installed any aftermarket or non-HONDA headlight bulb and/or socket, many of these are of inferior quality to the OEM Honda/Stanley bulb. Our product was designed to protect the STOCK Stanley headlamp bulb. Aftermarket bulbs, sockets, headlight socket wiring, and bulb filaments can and will fail due to manufacturing issues. The Pardue Brothers 6 Volt headlight Voltage regulator will be destroyed if the bike is run with a burned out headlamp. The Pardue Brothers 6 Volt headlight Voltage regulator will not prevent a headlamp bulb from blowing from normal causes, it helps prevent bulbs from blowing due to the Aging Stator/Over Volt problem. 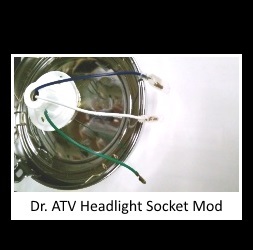 Look at the Dr. ATV headlight mod link for details. Running your bike with a burned-out headlight can ruin the regulator. Inexpensive headlights have poor connections and lower quality bulbs. Our product will protect these bulbs as much as possible, however when a bulb blows you need to replace it immediately, or remove the regulator from the bike until you can replace it. We will not replace a burned up headlight Voltage regulator. All too often a bike needs repairs such as basic maintenance to the wiring system, a new battery, connections cleaned or replaced, rectifier replaced, and all the other blown bulbs replaced with the correct Voltage and Wattage bulbs.